Details on Berryz Kobo’s final concerts have been released. Berryz Kobo will hold a two day live at Ariake Colloseum on February 28 and March 1. 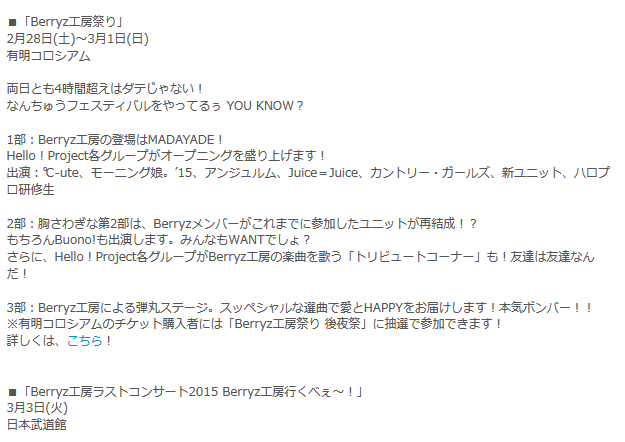 Titled Berryz Kobo Matsuri, the event will be a celebration of everything Berryz Kobo. Each day’s concert will last four hours and is divided into three parts: Part 1 will feature all other Hello! Project groups as warm-ups for the main event. Part 2 will feature the return of every unit a Berryz Kobo member has been part of in addition to other Hello! Project groups covering Berryz Kobo songs. Finally, Part 3 will consist entirely of performances by Berryz Kobo. Fans who attend the two-day concert can use their ticket to apply via lottery for yet another event on March 2. The title of Berryz Kobo’s Budokan concert on March 3 has also been revealed: Berryz Kobo Last Concert 2015 Berryz Kobo Ikube〜!